This week, let me introduce you to someone we can always take a tip or two from when it comes to blogging. 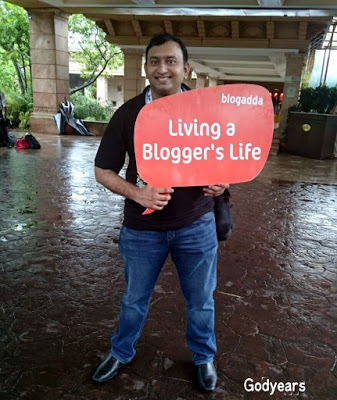 An Anesthesiologist by profession, blogger by seer passion, Dr. Roshan Radhakrishnan is a prominent blogger from India. His blog Godyears ( http://www.godyears.net/) has grown by leaps and bounds over a decade and in this interview, he shares a few tips and tricks to get the blogger in you going! So grab your writing pads and get ready to be amazed! You have been widely published both nationally (India) and internationally. Please give us a brief account of your publications? There is also at least one more to be announced soon so you can add a ‘q’ to the above queue. As I said… ‘a few’. Your blog Godyears is extremely popular it has been acknowledged as the “Best Creative Writing Blog in India”. Please tell us about your journey as a blogger? With the exception of examination answer sheets, I’ve always been guilty of writing. I have written (decidedly amateur) screenplays right through school and even college days while sitting in a dissection hall (anything to avoid staring at a dead body). I’ve had regular penpals and written long letters whenever I wanted to express myself during school and college days. Blogging was a natural extension of that – a need to write to express myself better. I honestly did not think I would last more than six months. Incidentally, many read the title and mistake it for a religious site. The fact is that I was just finishing my final month of internship after completing my MBBS and was going to start life as a doctor. I found it ironic how everyone used to say “doctors are equal to Gods”. The title is actually a play on my ‘Doc Years’… my ‘God Years’. Finding new friends online & being able to express myself freely were some of the early benefits of blogging back in the 2005-2008 era. As far as the blog was concerned, my own skills as a writer improved because here the feedback was from my peers who genuinely wanted me to be better. There was no need to sugarcoat my flaws or lack of talent. After probably a dozen rejection letters for fictional contests (I repeat, a dozen! So if you feel down because some writing contest did not select you, please go back to Question 1 and see where you can reach if you don’t give up. ), I finally got a story published (ironically, a real life medical story in the Chicken Soup series). More opportunities arose and I kept trying, failing occasionally but succeeding too. Today, I have more stories in print than even I can remember. 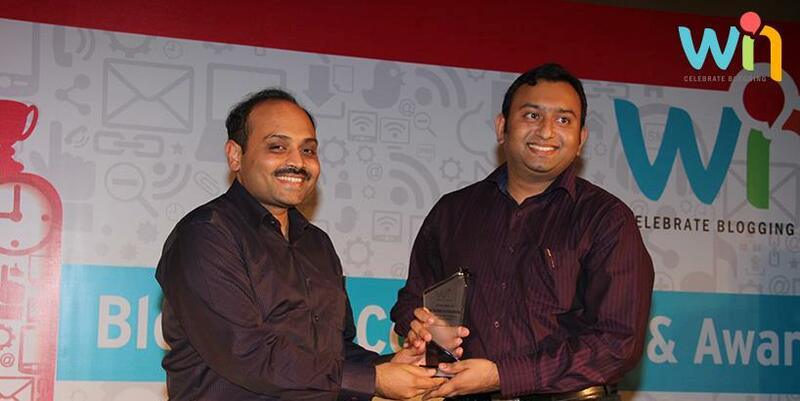 2014 was a pretty good year as India’s First Live Blogging Awards & Conference Ceremony was held in Mumbai. And with a prestigious jury that included celebrities like Shekhar Kapur, Ashwin Sanghi et al going through the list over months, I ended up winning the ‘Best Creative Writing Blog in India’ which really still remains the most awesome moment of my life. Even besides that though, it has been an eventful ride. Via the various blogging challenges, I have won close to Rs 1.5 lakh (2250 dollars) in prizes over the years. I have been privileged to be selected for vehicular launches and met celebrities ranging from Narain Kartikheyan to Usha Uthup and so many more, all due to the grace of the blog. I went viral last year for a post on how I would not allow my child to be a doctor in present day India, eventually ending up on NDTV, BBC and a few dozen other news media sites. It was a post based on stories I had heard from my peers for years. I just gave their thoughts and emotions a voice. As it turned out, it was a voice that the whole world wanted to listen to, a voice that had not been spoken out loud before. So the next time someone tells you that you are wasting time writing on your blog and it will not amount to anything, show them this long answer, okay? I think not having any literary prowess ended up being my strength. I’m not as talented as the wonderful blogger poets I see, not a good enough cook to run a food blog. So Godyears ended up being quintessentially me – a blog about a guy sharing his experiences as a human being; a sitcom addict, a pet lover, a budding writer, a voracious reader, a foodie, a silly clown, a sensitive romantic, a friend and yes, even a doctor. It is my blog’s USP – Something for Everyone. What has had the most impact on you when it comes to blogging? Making friends in the blogosphere. In real life, you find boundaries that define who your friends are – your college, your workplace, your city… sadly, sometimes your religion or caste too. But here via blogging, I get to see you via your thoughts. I get to know you. Devoid of boundaries, I get to make friends with like-minded people all over the world. It’s interesting to start a blog and write for a while. But most people lose interest after a few weeks. How did you manage to keep blogging for a solid 10 years? Tell us about your motivation. I did not expect to be here at the end of 10 months myself. I had finished my MBBS and was doing my internship when I started. Time was supposed to be a luxury back then with studies, entrance exams, post-graduation and everything in between. Blogging regularly for 10 years seemed a distant dream when I started. I just always had something to say, I guess. Something that needed to be put down on the site. And as time passed by, like me, the words too evolved based on my life experiences and there were new stories to tell, new points of view to consider. Recognition for the effort in blogging definitely mattered too, I cannot deny that. It was the pat on your back that told you that you were on the right path. What do you believe is the most important social media marketing strategy when it comes to blogging? But if you want me to be honest, I would rather you take the time and visit other blogs. Read their articles and comment on them. People will come to your blog to see who you are. And if they like your work, they will stay. What is the best way to generate traffic on a blog, according to your experience? Well, viral posts aside, I would say the clichéd ‘write on engaging topics’. Keep the articles short so as not to lose your reader and yet, give them something to think about. Ask a few questions at the end, encouraging them to share their views. For me, the post which went viral was quite long but the topic was something that caught the fancy of doctors all across India and eventually even the international media too. I did ask people whether they agreed with my views and responses poured in from all over the world. In one week, the blog had more footfalls than it had seen in the last 5 years. Where do you believe your blog will be in the next five years? I plan to keep writing as long as life allows me to. Hopefully the old readers will still be around and many more new friends would have been added to my circle by then. What is the most irritating/frustrating aspect of writing a blog? Sometimes you write an awesome article and no one comments. It just does not get any love! You then resort to all the social media marketing, forcing people to read the blog and at the end of it all? You get one click of the ‘like’ button from your mom on Facebook! Closing this interview, one final question, what is your message for the young, budding bloggers who aspire to make it big one day? While blogging is about showcasing your own voice, use it responsibly. We live in a world where the media is often accused of focusing on hate and sorrow. I sincerely hope you find it in you to use your writing skills to spread love, laughter and happiness. In dark tunnels, be the ray of light people turn to… the words they want to read at the end of a long day. Such a candid interview! Wow, Doc! Loved it!